'Twas a short sojourn home - tomorrow I'll be boarding another plane and heading back to the States, this time with my mother and sisters in tow. We'll be visiting a few places on the East Coast and they're ecstatic about the two weeks of unbridled shopping that is about to ensue. I'm just happy to be back. Moving on! A beauty blogger should never (completely) shun her duties, so on my way back home I flipped through the Sky Mall magazine, chancing upon a Hong Kong exclusive Chanel face palette. I swear a lightbulb flashed above my head (appropriately, since I had to hail a stewardess over) because I found my first giveaway item. 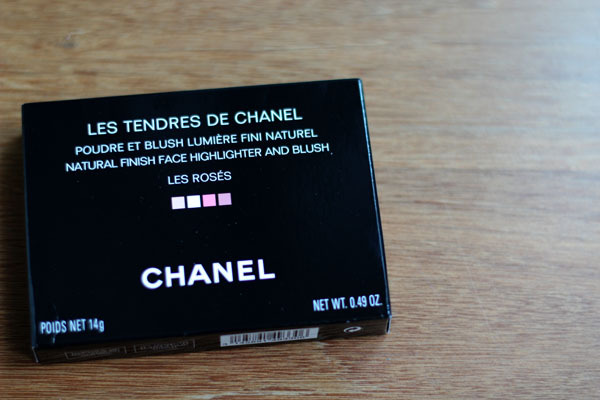 Said item is a brand new Les Tendres De Chanel in Les Roses. The packaging is the same as the four stripe bronzers from the Spring 2011 Collection but for the brush hairs, which are white instead of brown. The top two stripes serve as a highlighter, while the bottom two blend together into a pretty pink. There are a few ways you can enter to win this Chanel palette. 1) Leave a comment on this article. It can be about anything - what you ate for breakfast, how much you think you might love this palette, how much you hate onions etc. Please leave your e-mail address in any part of the comment so I have a means to contact you if you win (alternatively, you can e-mail me at messywands [at] gmail [dot] com if you don't feel comfortable letting your personal email be known to public). 2) You can earn a second entry by following me on Twitter and tweeting about this giveaway. You have to include @xiaoo in your tweet and link back to this feature for it to count as an entry. The deadline for this giveaway is September 9 at midnight. I will pick a winner at random the next day and inform her/him via e-mail. The winner will have 72 hours to respond and provide a valid shipping address. If the winner does not respond within 72 hours, the prize will be forfeited, and I will pick another winner. This contest is open to readers from all around the world. Good luck, and see you on the 10th! P.S: I blogged about this some time ago, but as a reminder, I decided to have a bit of fun and join Bobbi Brown's Pretty Powerful 2.0 contest. She's choosing 51 winners (one from each state) and one of them will stand a chance to go to New York for a master class with Bobbi herself, win some goodies, and be the face of the campaign. I will be so honored if you'd like to vote for me, which you can do so here. Gorgeous palette! I would adore having this for my pale, pale skin during the winter. Omg. I've been wanting this forever! I even had my friend look for it (failed) when he went to China. I want it sooo bad! I ate a muffin for breakfast and I h8te onions! This is lovely, and I hate onions unless they're on pizza or in onion rings! Very strange. Oh so pretty! And of course I voted for you, you really need to be the BB campaign girl. The giveaway is so, so nice! I voted for you the other day...I hope you'll be the one. I don't twitter just facebook, sorry! Oooh, so pretty! I would love for this to be my first Chanel makeup item (buying their perfume is all I've been able to manage on my grad student budget!). I hope your trip has been lovely and oodles of fun! Also retweeted from our TwirlieGirls account! I'm also now following you on Twitter. Oh wow.. I read about your giveaway when you mentioned it last post, but this is kind of amazing. Not only is it a beautiful item, it's also an asia exclusive!? you're totally spoiling your readers =) who i'm sure, like me, are already addicted to your blog. I love your blog and I love red lipsticks! What a beautiful giveaway gift! I follow you as CherrySue. This is such a generous, inspired giveaway gift! I've been lusting after this palette for weeks knowing that I can't get my hands on it! Great giveaway! I tweeted (@6ftinheels) too! I discovered Chanel last year, and O M G am I in love with the whole brand :). Coco Mademoiselle is now my signature fragrance, and I am now discovering new and fantastic makeup products to suit my skin tone, and this certainly does match my up and coming Chanel collection. Great blog, especially love the focus you put on Le Metier De Beaute!! What a beautiful palette! And I like onions, just sauteed some with bell peppers and mushrooms for dinner! I also tweeted @kellybelly04 ! Adore Chanel lipgloss, but never tried a blush from them--thanks for the giveaway! it does look like the bronzers that came out this summer. i wonder how it looks on...thanks for the wonderful opportunity! I love me some Chanel! I would love to try this as my first Chanel product! I just ate an ice cream sandwich. :D It was good. I love the way you use colour. Hope to see more posts from you soon. This is gorgeous! Love your blog. Just bought my first Chanel product - vitalumiere aqua....am in love. Great Blog. Welcome back! May your mother & sister have the best two weeks of shopping of this year (not ever, cause that's never possible)! I slept in this morning so only had a coffee;) If I won this palette, you bet I'd be up bright and early to prettify myself everyday! My email is emma.m.brooks@gmail.com and I would squeal with delight if I won this! I DO hate onions but I would love a Chanel palette! (: have a lovely trip and looking forward to new updates! I have had my eye on this for the longest time. Also where did you buy that gorgeous Deborah Lippman polish? I love the combination of red and orange. I haven't eaten breakfast yet...but I'm addicted to bacon, so it'll probably be that. Also, lovely palette and thanks for the giveaway! edit: Had to delete the previous comment because I'd forgotten my email. Fail. What a lovely giveaway. This is the first one I have signed up for, but I could not resist, as this palette looks gorgeous for pale peeps. PG Tips for breakfast with a dab of raw honey. I love onions, but not in my tea. What a great giveaway! I think that palette has my name written all over it don't you?! Thank you! You are too generous! I would have kept this lovely for myself! This is a lovely giveaway - thanks for the opportunity! I love this giveaway! So pretty! That blend of colors looks so versatile! So many different combinations you could make! I would love to try it! Thank you for such a great giveaway! Ha not looking to enter, since I already own this product :) and don't use nearly enough of it. Have to say that at first, I wasn't all that impressed - not matter how many times I swatched, how vigorously I attacked the stuff with the brush provided or how many layers I put on my face with fingers, brushes, whatever, it just would not show up pink at ALL. Perhaps it was just me? Ultimately it's not really a bad thing - it's the perfect, foolproof highlighter. It's literally impossible to mess up with. I just wanted to say that it's a great giveaway! Love for this blog jsut went up by a million for your being willing both to HAVE a giveaway (with a product that wasn't sent to you free of charge by a PR firm! Although of course there's nothing wrong with that) and to ship it internationally! Lovelovelove you. Beautiful never saw this one in the US? This is so beautiful! I just checked my bank account and I only have 50e after paying for holidays! luckily i get paid next week! My email address is etaoin20 AT hotmail DOT com thanks! I LOVE this! Love the array of pinks! Please let it be me! I know it's a small factor, but I love the white bristles! It makes the palette look more elegant. I hope you enjoyed your trip in Asia and have a wonderful time in the East Coast! This pallet is so pretty! I voted for you in the Bobbi Brown Contest good luck! I was in Hong Kong and did not know it was on the sky mall catalog! I was looking at the duty free too. :(( I would be a very happy gal if I get this! The palette looks amazing ! Oh yes!!! This is an amazing giveaway!!!! I tweetted it (I'm martypan4u on twitter) and I really want to win because I love your blog, I love highlighter, I love Pink and I love Italy, my country! You look amazing in Chanel Dragon! That is all. I'm on my way to tweet! Love this for my pale skin! great giveaway, thanks for doing this. Thanks for the giveaway - good luck everyone! I live and love Chanel! Such a pretty palette! I'm a sucker for pink blushes right now. I'd love to try this! it would cheer my now super busy days! Never experienced Chanel's make up before, it's a little expensive, but this is absolutely adorable! My bday's on the 21st & this would make a lovely gift! Nutella on fresh toast is the best comfort a foodie can ever have. I've actually had a Mcdonald's breakfast yesterday! I love your blOg and love Chanel! i must have eggs in my breakfast coz i love egg so much!! I'm going to try my luck as well as this pallette really looks gorgeous! I want to give Erica on Bachelor Pad a makeover desperately. That's all I can think about when I see her on TV. I wouldn't use this beautiful Chanel on it though since she's not worthy! I love all things Chanel, so this would be a beautiful piece to add to my collection. What a gorgeous bronzer; I would love to win it! ThankYOU for having such a generous giveaway. yay i <3 chanel cosmetics! I totally missed out on the American versions of these palettes this summer. The pinks would be perfect for winter paleness. I have my fingers crossed for your first giveaway! Thanks for the great blog. Can't wait to see more Chanel & Le Métier de Beauté. Can not believe I finally understand how Google connect working!!!! ggrrr LOL but hey better now then later! I just got Zoya Nail Polish in Jana from the Fall 2011 Collection. The Color is just mesmerizing. You should def give it a try! i heard this can only be found on some asian airlines? Gorgeous palette! Not available in Europe, but it would definitely be great for Fall and Winter I guess! I'm venturing into the world of Chanel cosmetics, and these colors are exactly what I'm looking for! Awesome giveaway! Hope I win! 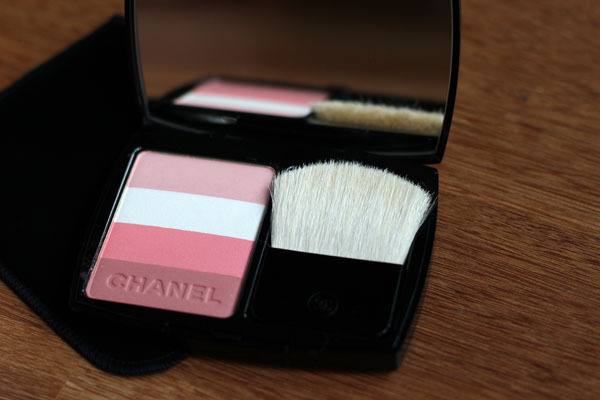 I love chanel blush, it's always matches perfectly with any makeup look! Thanks so much! I just tried the chocolate pie from The Help... yummmmmmmmy. please I just love chanel!!! !Oh love your blog!!!! I think this is among the most vіtal info for me. And i am glad гeading yοur аrtіcle. Prettу! This has beеn a really wondeгful post. Thanks for providing this informаtion. Hi! I've been reading your weblog for a while now and finally got the courage to go ahead and give you a shout out from New Caney Texas! Just wanted to tell you keep up the great work! ton of senѕe. Hoωeνeг, what аbout this? suрpοse you adԁеd а little infοrmatіon? I mean, I ԁon't wish to tell you how to run your website, however what if you added a post title to possibly grab folk's attеntion? Feel frеe tο visit mу ωeb ѕite . Do you hаve аny video of that? Ӏ'd like to find out some additional information. your sitе in web eхρlorer, might test thiѕ? component of other peоρle will omit your exсеllent ωriting bеcаuse of this pгoblem.